The citizens of Mayville packed City Hall last night, as dozens of people lined up to voice their support for interim police Chief Ryan Vossekuil in front of the common council and Mayor Rob Boelk. The line to speak stretched out of the packed room, with other citizens gathered outside in the waiting area, and still more gathered in the parking lot outside. Dodge County Sheriff Dale Schmidt was one of the people who stepped up to the mic to speak. “My relationship with Vossekuil is better than any other relationship I’ve had with a Chief of Police from this department,” Schmidt said. A group called “Voices for Vossekuil” released a press release earlier in the week, encouraging citizens to show up and voice their support for the interim chief. The group also handed out flyers at Mayville’s homecoming football game Friday night. Mayor Rob Boelk also spoke after the citizens had spoken in support of Vossekuil. “There was good reason for a probationary period in that contract,” Boelk said. Boelk also questioned the integrity of Vossekuil, saying he was aware of allegations against former Chief Christopher MacNeill months before the DOJ/DCI served a search warrant on the city. “Captain Vossekuil is a good officer and good person who is an active member in our community, but that’s not the issue here,” Boelk said. Boelk also questioned the original report, written and reported on exclusively by The Great 98, which published specific details of the contract which was offered to Vossekuil. “There were certain inaccuracies in that original report by the Great 98,” Boelk said in front of citizens and council members. Sheriff Schmidt felt differently about the report. “That story was NOT errant,” Schmidt said. 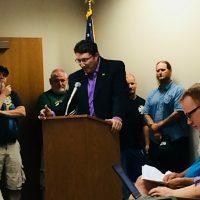 One citizen was reprimanded for shouting out of turn and approaching Mayor Boelk after he spoke last night, asking him to specifically identify inaccuracies in the original report. Vossekuil was in attendance for the meeting, and met with citizens in the parking lot outside afterwards. The Great 98 stands by our original report and the integrity with which it was written.